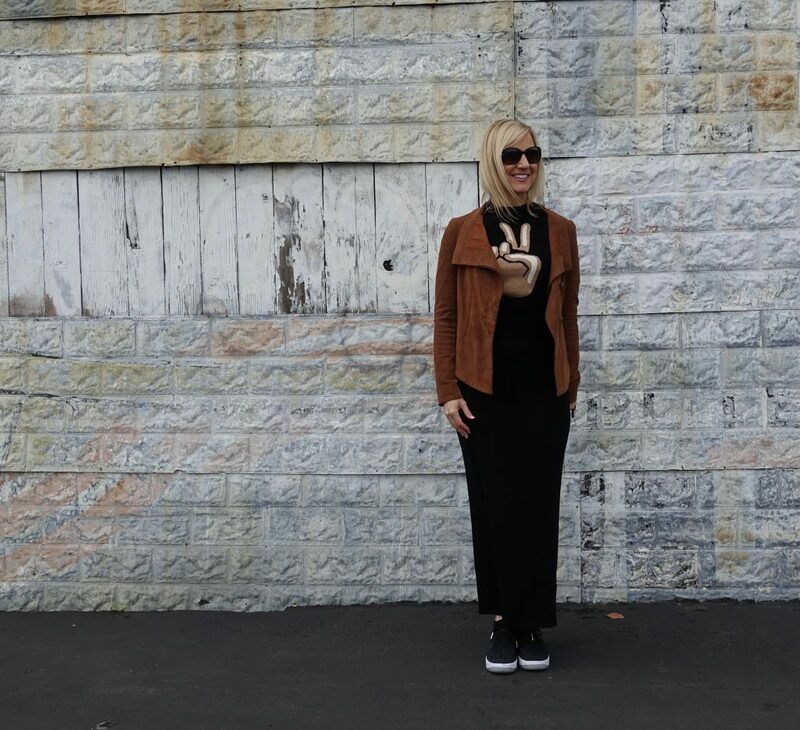 Layers worn over a maxi T-shirt dress made for a fun casual outfit when I was on California’s central coast last week. During my stay, temperatures dropped, and I needed a little more bundling than I expected. At the same time, I had packed light and my closet choices were limited. And so, you might imagine how delighted I was to discover how well this strappy T-shirt dress – still in my California closet from last summer – worked under a new cashmere sweater, suede jacket, and wool coat. Isn’t it great how we’re often more creative with limited choices? I think my Nike Flyknits also added to the fun, casual vibe. I have to confess that I did not create this look in a vacuum. My friend Christina recently sported a maxi dress with very cool sneakers – stay tuned for the post! And one of my looks on the street these days includes a mix of casual and tailored pieces. I also feel that this outfit is super casual without looking sloppy, and in a laid-back surf town like Santa Cruz, you will definitely stand out like an “outsider” if you dress too formally. That is, unless you show other signs of being relaxed and easy-going. I’ve noticed some attorneys at the courthouse, for example, wear a tailored suit with grown-out, shaggy hair and beard. No one wants to look like he or she is trying too hard – even if they are! 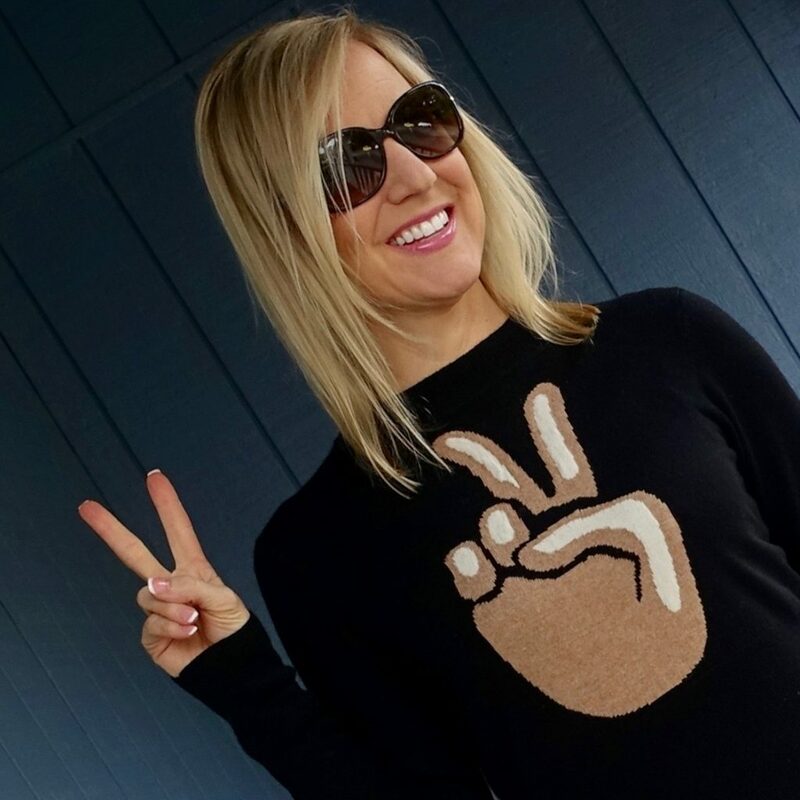 If you’ve been a reader for a while, you’ll know that I’ve never been fond of the idea of conformity for the sake of “fitting in.” However, there is this sort of cool easiness that I’ve bought into while living near the California coast. It resonates with me. Or perhaps it balances out my high-strung nature! At any rate, it’s a fun challenge to find ways to express my style in this environment. I hope that you liked the outfit. Are you resuscitating any of your warmer-weather pieces this winter? 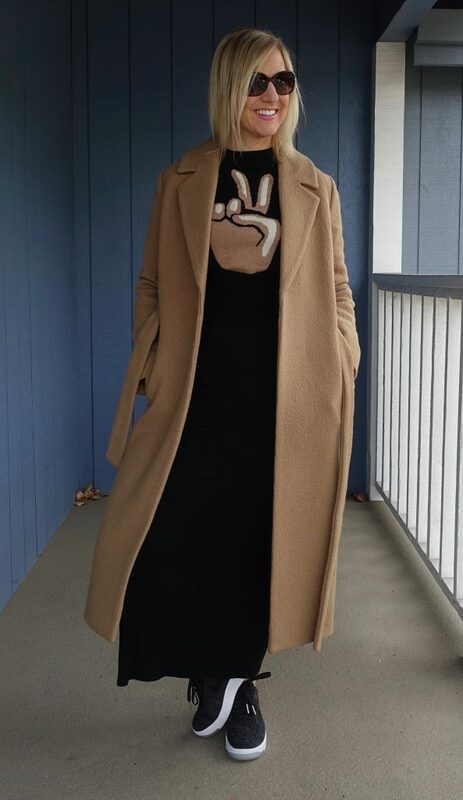 Wow, your t-shirt dress is absolutely cool and the camel coat is perfect!!! Love that pretty suede jacket, lady – the draping is too good! 🙂 Happy Thursday! Glad to see you again, Janea! I am so happy that you are expressing yourself more through style! Tailored with casual is my absolute fave style and I love how you wear it here! Thank you, Chichi. Glad you like it! ?